The Flow rate sensor BT40i measures the velocity of flowing water. It can be used to study the discharge, flow patterns, and sediment transport of flowing water. The Flow rate sensor is equipped with impeller rod with 5-meter cable. To assemble the sensor, simply unfold the four sections of the impeller rod and slide them together. Connect the rods to one another with a small push. 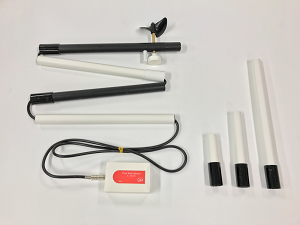 The sensor is delivered with three riser rods (short, medium, and long). The total length of the impeller rod, including all 3 risers, is 1.5 m.
The Flow rate sensor can be directly connected to analog BT inputs of the CMA interfaces.